Dry those tears; I’m back. Let’s start this new year off right with some announcements! 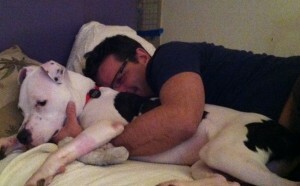 ANNOUNCEMENT #1: Kevin decided to foster a dog awaiting adoption through the Bully Project, which rescues pit bulls. It took a whole two days to find a permanent home for her. Say hello to our new baby, Pearl. She needs to quit buggin’ me. ANNOUNCEMENT #2: Among the many things I’ve been working on/obsessing over, I’m frantically writing a new show for my friend Lindsay Mendez (check out this outdated home page) and myself to do in the spring. It’s a revue (of sorts [we think]). We hit on the idea of doing a kind of song cycle – without being caught dead referring to it as a song cycle, of course – but when it came to choosing a theme, we found ourselves stumped at first. Love songs? – No, we hate those. Songs about living in New York? – No, we hate doing that. In fact, turns out that pretty much the only thing we actually like is hating things. So the working title of our show is “You’re Gonna Hate This,” and it examines various aspects of our favorite pastime! 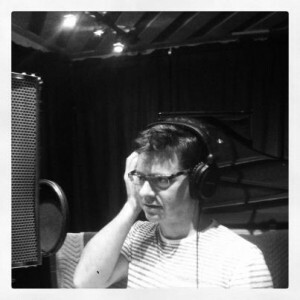 We just recorded a bunch of demos last Wednesday, so watch the Song of the Week page over the coming weeks (or Weeks, I suppose), as I’ll be posting some of ‘em after they’re mixed – oops, except we promised playbill.com an exclusive, so I guess one will be appearing there first, if I can get my act together. Rest assured I will make more ANNOUNCEMENTS as the need arises. Lindsay vowed to document the historic event photographically, then promptly forgot. Then made me stand in front of the mic and pretend at the end of the day. And then made me take this. Oh, and one more thing: I decided that all the song titles need to spell out the word “hate” for some reason – so expect the likes of “How Are The Eggs,” “He’s Angry This Evening,” “Haight Ashbury Trip Extension,” and many more!!! 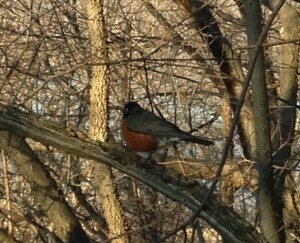 ANNOUNCEMENT #3: This is the first spring robin of 2013, which I photographed this morning in Inwood Hill Park. I saw the last summer robin of 2012 two weeks ago, but who’s counting. It needs to quit buggin’ me. 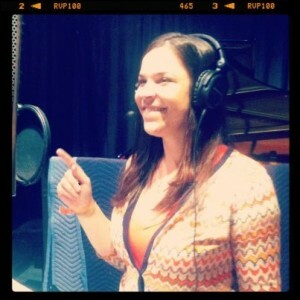 This entry was posted in Blog, Music, Musicals, News and tagged bully project, lindsay mendez, michael holland, Music, new songs, pit bulls, you're gonna hate this. Bookmark the permalink. Other song title suggestions: (for me) How Art Thou, Ed? (and for the theme of hatred) Have A Terrible Ever; or Hindered, Addled, Thuggish, Embittered (and random effort) Hillbilly Arnold’s Tragic Exit. You’re welcome.